A trip to Dream Park is a must for children of all ages and makes a great day out for the whole family. Featuring rides, shops, fun activities and simulators, the 160-acre Dream Park is also encircled by a train, making access easy. 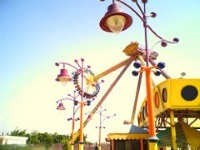 Visitors can enjoy a number of stomach-turning adventure rides, or a selection of mellow family rides, as well as two theatres and one of the largest concert areas in Cairo. Numerous restaurants provide refuelling stops, and there is a selection of gift shops for souvenirs. The Dream Park claims to be the largest and most unique amusement park in the Middle East and can host up to 30,000 visitors. It was designed by the same people who designed Universal Studios. Opening times: 10am until at least 7pm. Admission: Fees vary depending on ticket type.